Join Seniors in Service for a joyful celebration of the valuable impact our volunteers make in the lives of children, seniors and veterans in our community. We’re Lovin’ It! 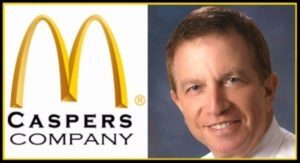 Tampa Bay’s own Bob Conigliaro, VP of Community Relations for McDonald’s (Caspers Company), will share how Caspers achieves 30% more revenue than the typical McDonalds by focusing on people, community and their commitment to “Generate Happiness”. Hear how Seniors in Service volunteers Generate Happiness by being “Geared Up to Serve”! • A Foster Grandparent Volunteer inspires a struggling Kindergartner to read with daily tutoring and encouragement, overcoming life challenges to create a lifelong learner. • A Senior Companion helps three generations live their fullest lives – an elderly veteran who wants to remain living at home; his overwhelmed wife, now fulltime caregiver; and their adult daughter who often misses work to help out and worries constantly about both of them. This Bridging Generations Breakfast is an event NOT to be missed! Be inspired by the positive impact Seniors in Service volunteers are making in the lives of school children, homebound elderly and veterans. Network with other civic-minded business people from the Tampa Bay area. Find out how people (like you!) can “Gear Up” to Generate Happiness… and maybe even win a fantastic prize! Please contact Robin Ingles if you have any questions.